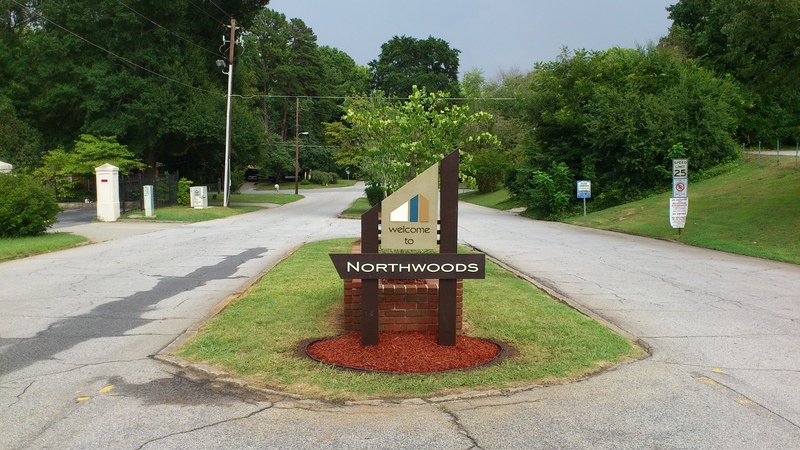 In 2009, Michael Halbert, a resident of Doraville’s Northwoods neighborhood, showed a concept for a new neighborhood entrance sign to Cindy Bradford (who also lives in Northwoods, just a few doors down from him). She loved the design, and kept showing it to people around the city, looking for a way to replace the neighborhood’s existing signage with the new sign. The existing entrance signs had been commissioned by the city many years ago. While functional, they were starting to look a little worn, and they were not very noticeable. Here is a picture of one of the entrance signs as they existed at the time Cindy started publicizing Michael’s design. In November, 2010, Cindy contacted Bonnie Grey Flynt, the president of the Northwoods Area Neighborhood Association (NANA), and showed her Michael’s entrance sign concept. Bonnie brought the topic up at one of NANA’s meetings, and the general consensus was that Michael’s sign concept was fantastic – perfect for Northwoods. It also helped people realize how sad the existing signage looked. After a little discussion and opening it up to the neighbors, NANA made a decision to put together a committee (led by Cindy Bradford) that would work on raising money for and installing new signs. Bonnie was also able to get permission from the Mayor and city council to install new signs in place of the existing ones if NANA could raise the funds. For over a year, Cindy and the sign committee worked to bring Michael’s mid-century inspired entrance sign to life. They raised money, decided on placement of the first entrance sign, worked with the city on permitting, received bids, selected vendors, and finally set the date for the first install. The first of the new entrance signs finally went into the ground at the McClave entrance into the neighborhood (off Buford Highway) on Friday, July 13. Despite the supposedly unlucky date, everything went really well and the install was not marred by bad weather or faulty design. This is good, because the neighborhood held a dedication ceremony for the new sign the following morning – on Saturday, July 14 at 8am. In preparation for the event, the city had public works remove the old sign, cut the grass and pick up litter from the area. Some neighbors who have requested anonymity also scrubbed the brick planter and re-planted it. NANA President, Bonnie Grey Flynt kicked the ceremony off with an introductory speech that touched on the area’s nomination to the national register of historic places. She also presented a NANA Presidential award to Michael Halbert for designing the new Northwoods sign. Cindy Bradford then spoke for a few minutes about the journey the neighborhood has taken so far to get to this point, and also about the work still to do (there are about 4 other entrances to the neighborhood that will need signs). Finally, it was time for the dedication. Cindy Bradford and Doraville Mayor, Donna Pittman did the honors of cutting the ribbons wrapped around the entrance sign. It was a great event that brought people from all over Northwoods and Doraville together. There was even confetti and a champagne mimosa toast to commemorate the occasion. Most importantly, it was an awesome reminder of it every day when people drive into the neighborhood now. You can view more pictures at the Historic Northwoods Neighborhood Facebook group. DORAVILLE – For Northwoods, one of the oldest and largest neighborhoods in Doraville, everything old is new again as residents prepare to unveil new signage at the first of four main entrances into the community. The dedication ceremony for the first sign is planned for July 14 at 8 a.m. at the intersection of Buford Highway and McClave Drive. Construction of the new mid-century inspired signs, designed by Northwoods resident Michael Halbert, was prompted in part by the quiet bedroom community’s nomination to be placed on the National Trust for Historic Preservation’s National Register. Once the designation is awarded, the subdivision will share the honor with other Atlanta-area National Register communities such as Inman Park and Avondale Estates. For over half a century, Northwoods has been credited with being the only “California-style” tract community of ranch homes in Georgia. The planned community, a novel concept in the 1950s, featured homes designed by Mastin & Summer, two parks, churches, the first shopping center in Doraville, schools designed by Atlanta master architect John Portman, and a professional office building. When completed, it was virtually a village within a city. Located just inside the perimeter, the neighborhood has grown over the years to nearly 1,000 homes. Eighty-nine percent of them were originally built in the mid-century architectural style in the 1950s, a style whose popularity is resurfacing today as many new homeowners crave the “retro” look for their homes and interior designs. The new signage is but one example of the mid-century inspired renaissance occurring in Northwoods. Home owners are actively renovating, bringing their homes back to their original look, and even going so far as to install new mailboxes with the clean lines inherent to the mid-century style. All of the new signs were totally funded by Northwoods residents’ donations and construction is being done by Signworks Unlimited. The additional signs will be installed over the coming months. Beautiful sign and lots of hard work. Thanks to all and especially to Cindy. We miss you.